This handy guide will tell you all there is to know about printing your printables, and which paper and other materials to use. For most printables I would recommend a paper thickness of at least 110 lb / 175 gsm. Be mindful of the maximum paper thickness your printer can handle. You can find this in your printer’s manual. Some printers may not be able to handle anything thicker than normal computer paper. You can buy any type of paper that you want. White, ivory, cream… the choice is yours. Here are some recommendations for paper. All of Clementine Creative’s printables print out on US Letter (North America) and A4 (International) sized paper. Greeting cards fit to an A7 envelope. You can buy envelopes from French Paper. 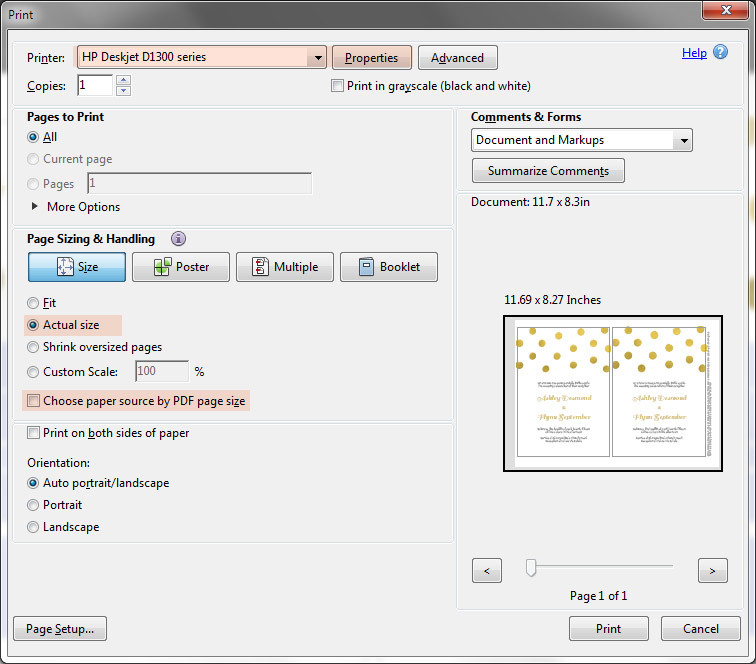 Here are some recommendations for online copy shops that allow you to upload a PDF and get it printed. Any copy shop should be able to print printable PDFs. If you’re printing at home, it’s best to use a colour printer. Laser printers will have the highest quality, but are also more expensive than inkjet printers. If you’re going to be cutting out circles, it’s easier to use a punch. 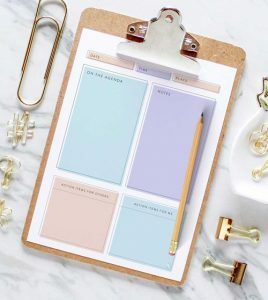 This 1-inch craft punch will be perfect for these printable student planner stickers. If you have never done this before – don’t worry! It’s easy. All of Clementine Creative’s printables are PDF files. You will need Adobe Reader to open them. If you don’t have it installed, you can download it (for free) here. After opening the file, go to File – Print. The Print window will open. Choose your printer from the drop-down menu at the top. Depending on your printer, there might be extra settings under a “properties” tab. Click it and choose the correct paper size and paper type you’re using. After that’s done, you’re back to the print window. Under Page Size and Handling, choose “actual size”. If the artwork doesn’t fit on the page you can select the “fit” option. Try not to use the “shrink oversized pages” option because it will shrink the image, make it print smaller than it is and possibly make it look pixelated. Keep your eye on the preview on the right. You might want to check “choose paper source by PDF page size”. If the contents don’t fit on the page, just uncheck it. So, your printable has been printed and it looks great. Now we just need to cut it out. This only applies to greeting cards and desk calendars. 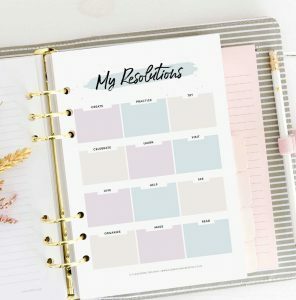 Our other printables like planner pages, inspirational art and wall calendars, don’t require any cutting. 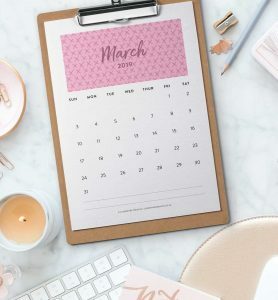 Some printables (greeting cards and desk calendars) have dotted lines to show you were to cut. 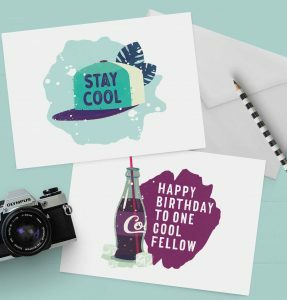 The artwork on Clementine Creative’s printables extends beyond the cut lines so that your finished card doesn’t have any white edges + so that it will look professional. Cut on the inside of the dotted lines with scissors or a craft knife and metal ruler. If you use a craft knife, it might be a good idea to use a cutting mat! This will produce the best results and make the final result look professional! Do you have any questions or problems? Feel free to contact me here.